Yoga with my Friends is A-O-KAY! The Message is in the Movement, the Magic is in the Music! Children’s yoga classes with Miss Barbara are music-based, silly & energetic, with inspired movement, songs, fun props, & magic yoga-mat rides! 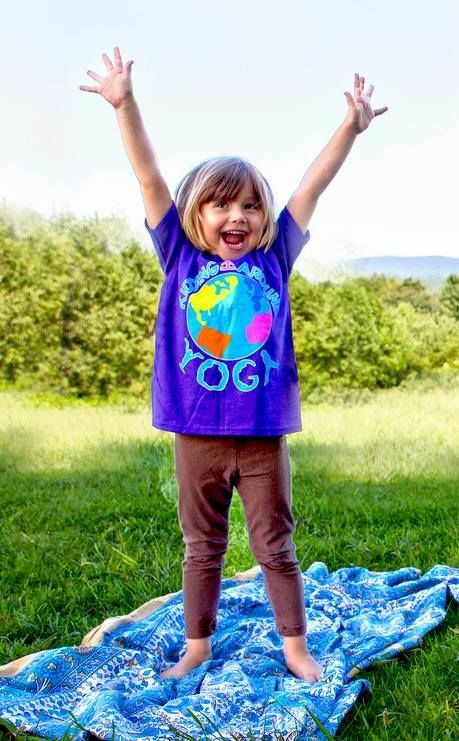 While learning yoga postures, & child-appropriate deep breathing, & relaxation techniques, together we develop coordination, flexibility, focus, strength & balance, while cultivating creativity, cooperation, kindness, an attitude of gratitude, clear minds & joyful hearts. blossoming into inspired & peaceful children! For pre-schoolers & their favorite adults — 30-minute programs. Barbara Gail, B.A. Education, is Certified in & is a former Licensee of Kidding Around Yoga™, is a 200-hour Certified Yoga Teacher, & Natural Choice Award winner for Higher Calling, Favorite Children’s Program, Business of the Year, & Woman of the Year. To find a class near you, please visit my Calendar Page. And to learn how to bring this program to your group, please give me a call at 941-223-0180. I’d be happy to speak with you! A World of Drums: The Magic of Rhythm for Kids! This lively presentation & hands-on program joins strangers & friends for community-style music-making, is appropriate for all sorts of groups & ages, & it’s entertaining, educational & fun! Requiring absolutely no prior musical experience, it includes participation of everyone, & can inspire newcomers to rhythm & music, awaken the latent musician within, & expand the possibilities of those who are already musically active. “A World of Drums: The Magic of Rhythm!” in schools, camps, libraries, houses, churches, home-school gatherings, community centers, special needs groups, & family-style neighborhood venues, since 1994. The heartbeat is our common ground, we all inherently know the universal language of rhythm. Music-making is something everyday folks used to do before the age of television, but now it’s been so long we’ve forgotten how to do it & have lost our confidence along the way. Providing quality edu-tainment & a positive rhythm experience for everyone, this gets us all into the groove. Adults appreciate the multi-cultural aspects, the beautiful instruments, & permission to feel like a kid again. Children love rhythm, & naturally respond to it. Group rhythm offers creative enrichment & a healthy outlet for self-expression, while emphasizing positive social qualities we wish to foster in our children & practice ourselves: community spirit, geographical & cultural awareness, listening skills, a cooperative attitude, & respect. Relaxing while energizing, developing cognition & coordination, the benefits of the drum circle have been well-documented in the fields of health, wellness, & the education of children. And everyone loves making a loud, joyful noise! You’ll learn about & play an amazing & varied large collection of exotic & fascinating boomers, bangers, clingers, clangers, shakers, scrapers, dingers, & dongers (a.k.a. percussion instruments!) from around the world, primarily made by indigenous artisans of natural materials. Over 40 different & fascinating instruments can be provided! So let’s get ready to boom boom cha! Play drums, rattles, bells, move your body, dance a beat! A family-style music & movement program, where children learn, blossom, & grow in our circle! social skills; while developing body awareness, spatial orientation, & sense of self within a group, all in a positive style. Enjoy quality time with your child, sharing your joy in music & movement! All instruments & props are provided (yours welcome, too) in this cooperative & positive program for children’s creative expression & musical & physical education. 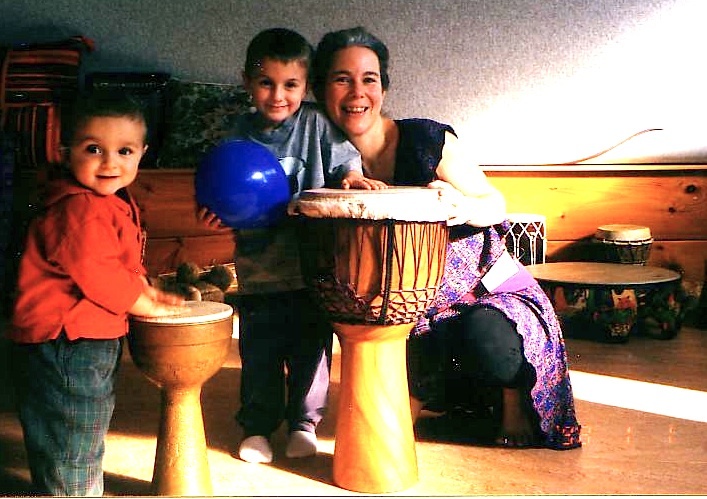 Miss Barbara has been skillfully teaching & developing this original group program of music & movement for preschool children (formerly “The Magic of Drum & Dance for the Young Child”), since 1994. It’s also been given as one-time experiences in preschools & special needs classrooms, & has been conducted as Teacher Trainings in Head Start Programs & Teacher’s Conferences. Barbara Gail, B.A. 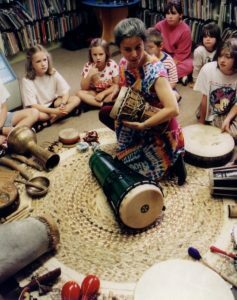 Education, developed this unique program in 2013-14 during her position as the weekly pre-school, kindergarten, & 1st grade music teacher for about 100 children, at Island Village Montessori, in Venice, Florida. 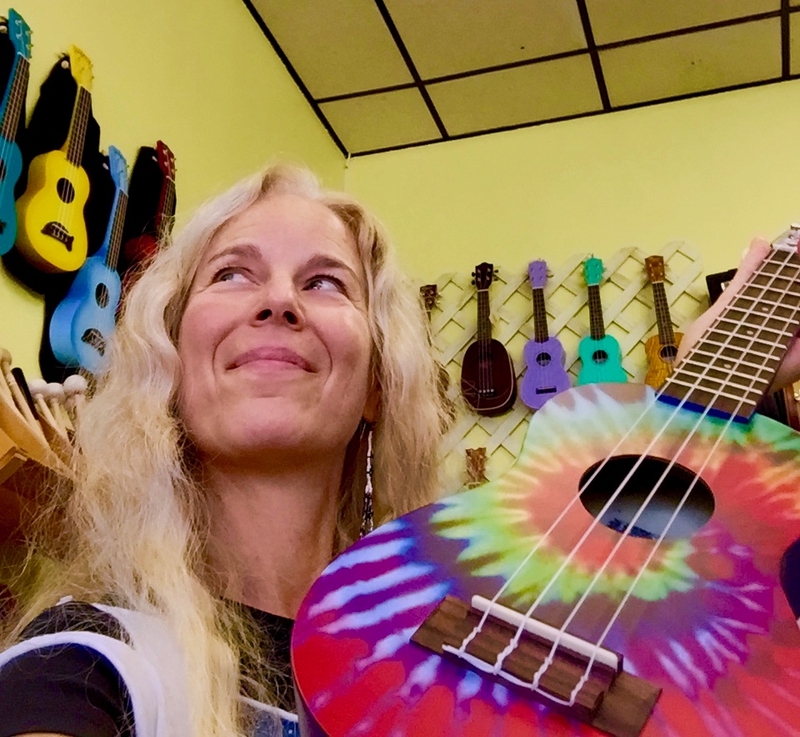 rhythm & music based children’s programs, she blends exposure to the ukulele, group singing with kinetic activity, & total hands-on merriment with a wide variety of folkloric drums & percussion from various world ethnic groups. All instruments & props are provided in this cooperative & positive program for children’s creative expression & musical education.